When we think of Black History, our perception is limited to Martin Luther King, slavery, and civil rights marches. But our history is rich with unsung heroes who have taken our knowledge of science, medicine, and philosophy to new heights. One such hero is Dr. Sebi – the greatest healer the Black race has produced since Imhotep. In his lifetime, Dr. Sebi rose from humble beginnings to become a powerful teacher and naturalist. He changed the way we understand our bodies, our souls, and how we nurture both. His healing village in Honduras brought the rich and the poor together to restore their life forces. Heroes like Dr. Sebi represent real Black history, and every man, woman, and child should honor his memory by learning his story. The Dr. Sebi biography begins in Ilanga, Honduras. On November 26, 1933 Alfredo Bowman was born into a family of healers. His Grandmother – Mama Hay – was an indigenous African born in Mexico who taught young Alfredo the secrets and science of herbal healing. It was this education that would lay the foundation for the African Bio-Electric Cell Food Therapy that Dr Sebi would later develop. As a young adult, Alfredo Bowman left his home in Honduras to work as a steam engineer in Los Angeles. Being exposed to a new, Western diet, Alfredo became overweight and his health deteriorated. diagnosed with asthma, diabetes, impotency, and obesity. He returned to the lessons of his elders and begun to treat himself with the help of natural vegetation cell food compounds. His peers were amazed by his transformation as he shed weight and was relieved of the illnesses that came with obesity. He shared the compounds and nutritional guides he used with those around him. When they began to bear witness to the integrity of his methods, Alfredo established the USHA Research Institute with offices in Los Angeles and New York, becoming the Dr. Sebi that we know today. Dr Sebi began to realize the con game being played on the sick by major pharmaceutical companies. He was quoted as saying “A society that keeps cures a secret so they can continue to sell medication for huge profits is not a real society but a huge mental asylum.” This won him enemies at the highest levels of industry. Agents infiltrated Dr. Sebi’s practice office with listening devices. When he admitted to curing diseases and providing diagnosis, he was taken into custody. At his trial, dozens of people that he had cured of herpes, AIDS, and other diseases gave witness that Dr. Sebis was the truth. The courts were forced to release him and clear his name. Dr. Sebi had defeated the Supreme Court with Supreme Truth. With his credibility in tact, people from all over the world and all walks of life made the pilgrimage to Dr. Sebi’s healing village. The village was built in Honduras to serve as a model for the maintenance of natural health. Free audiobook! Sojourn to Honduras Sojourn to Healing explores Dr. Sebi's views on AIDS, diabetes, cancer, his success in treating these diseases and the social and political roadblocks he's faced while doing so. One of the secrets of the village is a 200 degree alkaline geo-thermal spring. Dr Sebi built a dam to divert the water from the spring to a healing pool. The body is made up of both alkaline and acidic substances but it needs to be in a slightly alkaline state to support health and homeostasis. The alkaline geo-thermal spring water help to reverse disease because an alkaline environment in the body removes excess hydrogen and allows the body to be properly oxygenated. Thus, by bathing in and drinking alkaline spring water, you develop an internal environment that kills disease. If you are interested in visiting the Usha healing village, seven days will cost $1,500.00 per person, and consist of room, board, and mineral treatments. Payment can be made at Dr Sebi’s Los Angeles Office, or by calling (310) 838-2490. You can reach the village by phone at 310-742-3749, and the village offers transportation to and from Goloson International Airport in La Cieba, Honduras. For more information, visit Usha Healing Village Blogspot. When western medicine and therapy failed him, Michael Jackson reached out to Dr Sebi for treatment. Between 2003 and 2004, Dr Sebi treated Michael Jackson at Usha Village, and was frequently seen travelling with the artist. “He was brought in to cure the symptoms of Jackson’s pain, so he wouldn’t need painkillers anymore,” a source close to Jackson said. But when Jacksons camp refused to pay for the services Dr. Sebi provided to the tune of $380,000, he was forced to sue. 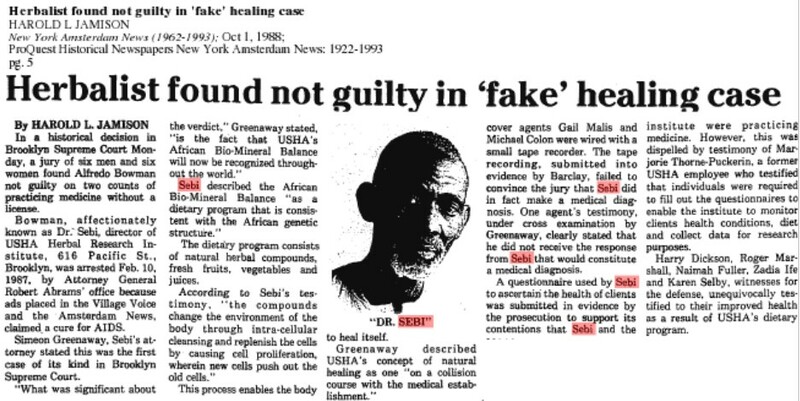 Ultimately, the case was dismissed, but the proof of Dr. Sebi’s methods were on display for all the world to see in the form of a healthy, happy Michael Jackson. During his life, Dr. Sebi also treated Lisa ‘Left Eye’ Lopez, who died while in Honduras working with with him at Usha Village. Dr. Sebi made his transition August 6, 2016. He was 82.While traveling in Honduras, Dr. Sebi was arrested and held without charges. Allegedly, he had a large amount of cash on him and was suspected of money laundering, but no formal charges were filed. Without access to healing foods and compounds, his health quickly deteriorated. He died shortly after being arrested, with some crying conspiracy. He left behind 17 children to continue his work and his legacy. Although Dr. Sebi was born in and spent his life in Honduras, he never considered himself an “Afro-Honduran”. Rather, he understood that his ancestors were African, and called himself “an African Man born in Honduras” until the end of his life. In doing so, he embodied the essence of what it means to be Pan-African: he placed his people before any political loyalty! Dr. Sebi made his transition August 6, 2016. At the time of his death, few had ever heard of the man who cured cancer, AIDS, and diabetes. Newspapers barely covered his life or his death, and the mainstream media wrote Dr Sebi off as a quack, fraud, and scam artist. The world owes our Ancestor Dr Sebi a debt of gratitude, and you owe it to his legacy to learn about what made him great! Dr. Sebi is real Black history!